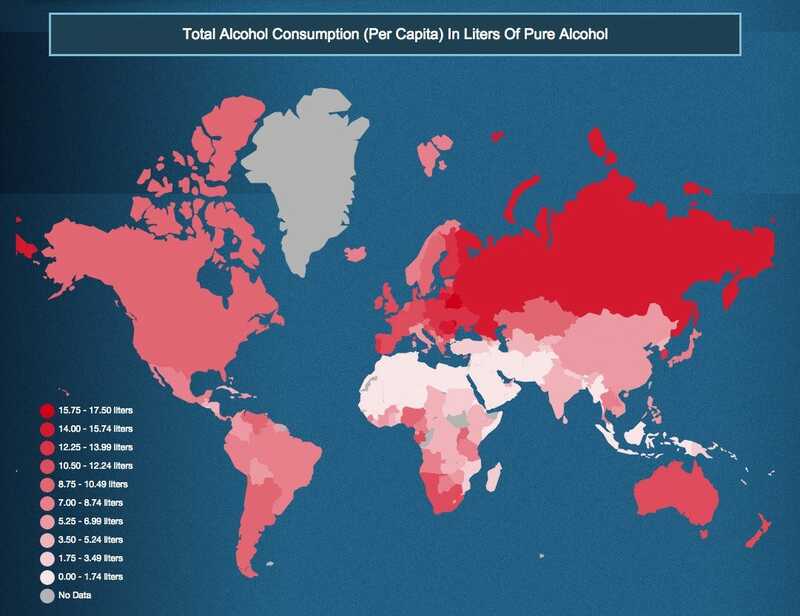 Perhaps surprisingly, Russia is not the drunkest country in the world. That title goes to Belarus, whose residents enjoy just over 2 liters of alcohol more a year than Russians. Wasted Worldwide, a website that compares drinking habits around the world, created a series of maps that reveal which countries drink the most, what types of alcohol are most popular, and which countries have the most alcohol-related deaths. 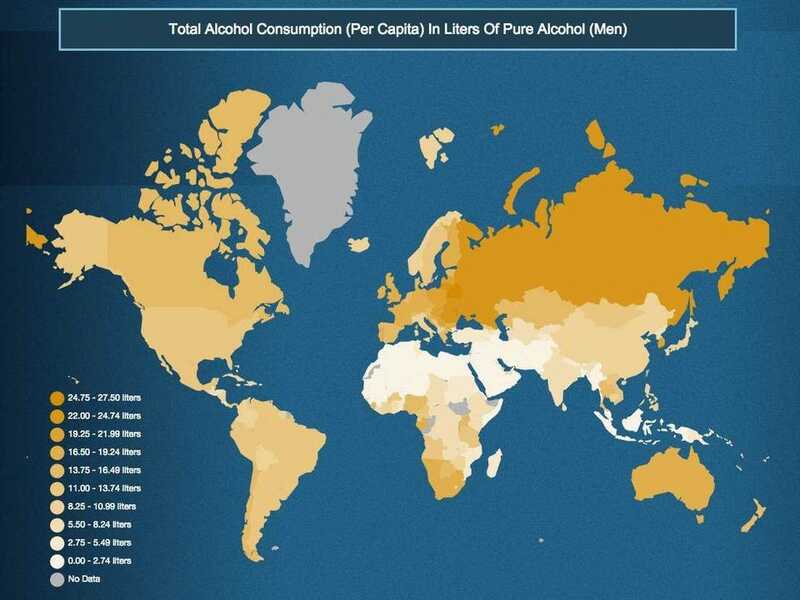 To create these maps, they used data from the 2014 Global Status Report On Alcohol and Health. They've allowed us to publish some of their maps below. Belarus drinks the most alcohol in the world, with an average consumption of 17.5 liters. Russia comes in second with an average consumption of 15.1 liters.  The United States consumes a a relatively reasonable average of 9.2 liters, which is also less than the UK (11..6 liters) and Ireland (11.9 liters). Unsurprisingly, countries in the Middle East and northern Africa drink the least: People in Libya and Mauritania drink an average 0.1 liters, Saudi Arabia drinks 0.2 liters, and Egypt drinks 0.4 liters. Men drink the most alcohol in Belarus, consuming an incredibly high average 27.5 liters. Russian men also like their alcohol, drinking an average of 23.9 liters, as do Romanian men, who drink 22.6 liters. American men drink 13.6 liters on average. 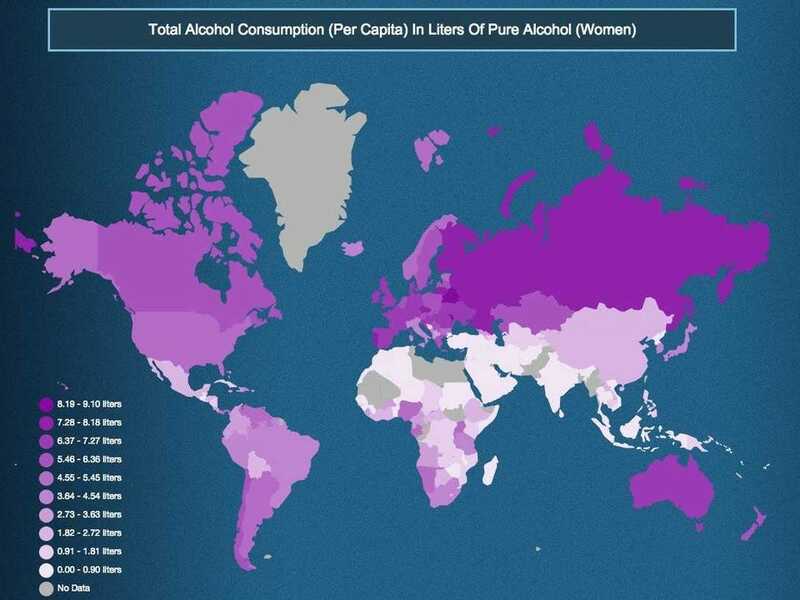 Women generally drink less than men, but in some countries they drink a lot. Women in Belarus still drink the most of any country, consuming an average 9.1 liters of alcohol. Moldova comes in right behind at 8.9 liters. Russian and Czech women drink an average 7.8 liters, Portuguese women drink 7.6 liters, and Australian and Ukrainian women drink 7.2 liters. Surprisingly, beer is the most popular alcoholic drink in Yemen and Bhutan, where it's the only type of alcohol consumed. It's also the most popular drink in Vietnam (97.3%), Namibia (96.7%), Indonesia (84.5%), Myanmar (82.6%), and Mexico (75.7%). 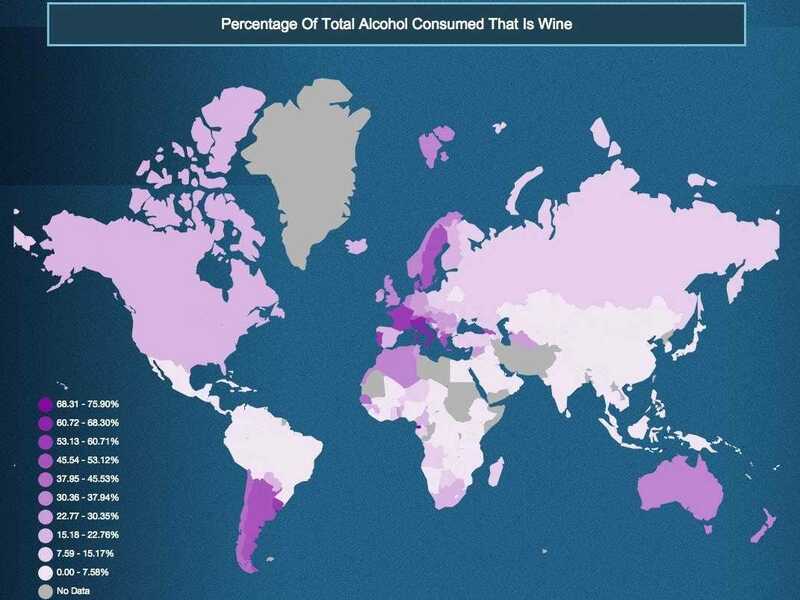 Wine is the most popular beverage of choice in Europe by far. 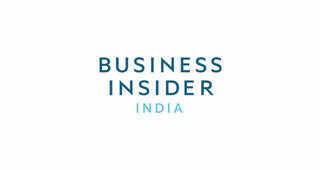 In Italy, 65.6% of the alcohol consumed is wine, in France it's 56.4%, and in Portugal it's 55.5%. It's also a popular drink in Uruguay (59.9%) and Argentina (48%). Haitians love their hard liquor: 99.6% of the alcohol consumed there is spirits. 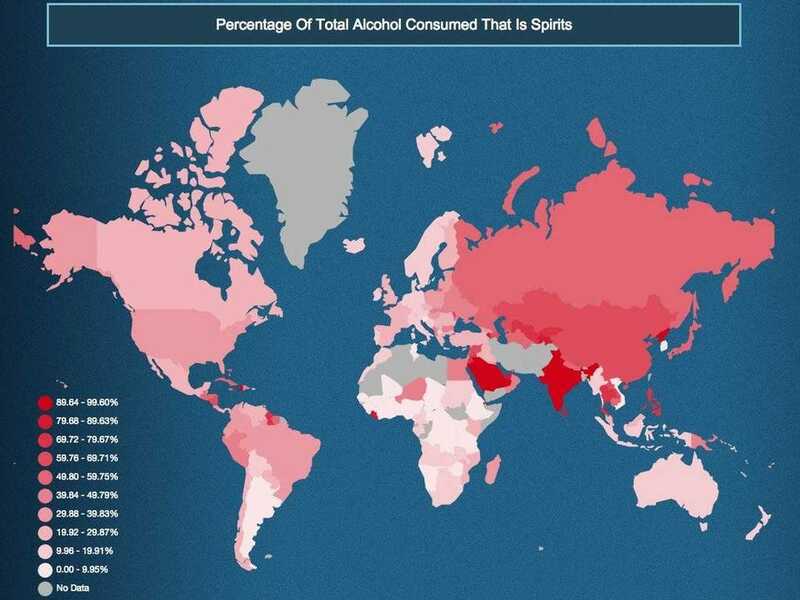 It's also the most popular form of alcohol in Saudi Arabia (97.9%), North Korea (94.9%), India (93.9%), and Liberia (88.1%). Hungary has the most alcohol-related disorders, with 19.3% of the population suffering from one. 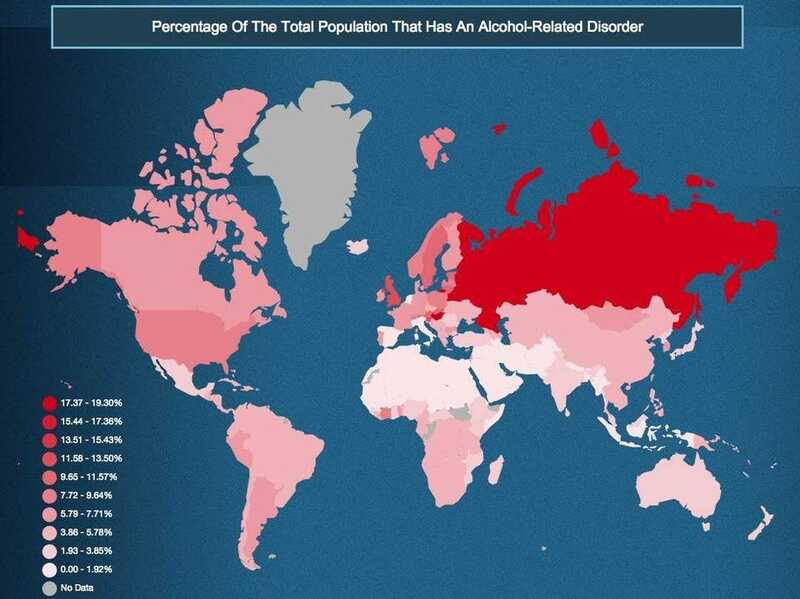 In Russia, 18.2% of the population has an alcohol disorder and in Belarus, the drunkest country, 17.5% of the population has a disorder. Belarus has the highest number of alcohol-related deaths, with 34.7% of people dying from alcohol each year. Ukraine is right behind with 34.4% of deaths related to alcohol. Lithuania (30.9%) and Russia (30.5%) also have a high number of alcohol-related deaths.